The law schools of eight prestigious English universities plan to make prospective undergraduates sit a new admissions test from this autumn. It will help them discern "intellectual potential" among the large numbers of well-qualified applicants. They say the National Admissions Test for Law (LNat) will be designed to be used alongside GCSEs, A-levels and "other existing selection mechanisms". The two-hour test will involve multiple choice questions and a short essay. Sample question papers will be provided for practice over the next few months, with the first real tests being taken in November. A similar test for medicine and dentistry was introduced last year. 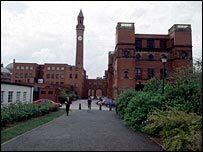 The development is being co-ordinated by the University of Birmingham. Its undergraduate law admissions dean, Dr Tim Kaye, said: "The growing number of candidates with top scores at GCSE and A-level has made it increasingly difficult for the most competitive law schools in the country to rank their applicants satisfactorily. "To help with this problem, several of the law schools involved in this proposal already have, or were about to adopt, admissions tests of their own. "The LNat will allow them to pool their expertise, reduce the overall number of tests taken by aspiring law students, and give more even-handed and transparent consideration to all of their candidates." He added: "In GCSEs and A-levels we already have measures of existing educational achievement, which is important. "But we would like to do more to identify relevant intellectual potential, which is also important." Law is an extremely popular subject at degree level. Birmingham's law school has about 2,000 applicants for about 220 places. A number of universities - most notably, Bristol - have incurred the wrath of some head teachers by trying to choose what they regard as the best potential students - not necessarily those with the highest grades. An official review of university admissions is being carried out by a team led by Brunel's vice-chancellor, Steven Schwartz. Overseas candidates from outside the EU will not have to sit the new law test. "For every place at a top university there are ten applications"